The 2004 film Downfall, set in Hitler&#146;s bunker, at times makes Hitler seem if not sympathetic, at least comprehensible in a way few films have dared. His right-hand man, Josef Goebbels, by contrast, is portrayed as pretty much unremittingly evil, being permitted only one brief moment in which he falters &#150; not because of what he&#146;s done, but because the Fuehrer seems to be trying to send him away, and he refuses to go. That&#146;s the way he comes across in The Goebbels Experiment, too. The film is a collection of historic and stock footage, narrated through excerpts from Goebbels&#146; diary, read by Kenneth Branagh. Thus, its title is somewhat confusing, as it&#146;s not much more experimental than the average History Channel documentary. 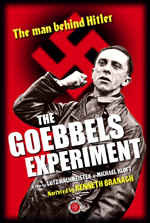 Nonetheless, it&#146;s a fascinating film that provides new insights into Goebbels&#146; personality. And about that personality: The biggest surprise in The Goebbels Experiment is what a whiny, almost bipolar crybaby its subject seems to have been. The journal entries which are read seem to alternate between arrogant triumphalism following each Nazi political victory (frequently joined by a burst of virulent anti-Semitism), and craven self-pity &#150; he&#146;s forever griping about some perceived slight. Goebbels even sees his new job as propaganda chief, initially, as an attempt to limit his power; he wanted a more explicitly political office. And before the Nazis&#146; rise to power, he&#146;s even worse, coming across as depressive, racked by self-loathing and as obsessed with money (and the lack of it) as he accuses the Jews of being. Goebbels&#146; almost romantic devotion to Hitler &#150; both as a man and a symbol &#150; is somewhat shocking, too. At one point, he writes, &#147;When the Fuehrer leaves, I stay behind, feeling sad.&#148; This is the attitude of a teenage girl, not the propaganda minister for Europe&#146;s most vicious and (at the time) powerful political regime. The Goebbels Experiment weirdly omits any mention of Triumph Of The Will, the single greatest propaganda achievement of the Nazi era. Obviously, as Hitler&#146;s propaganda chief, Goebbels had a large role in the commissioning and distribution of the film, but he hated director Leni Riefenstahl, so director Lutz Hachmeister chose to omit whatever he said about the movie. He does bash her a bit in journal entries from 1936, while she was filming Olympiad; this is juxtaposed with footage of him, stone-faced, giving her an award for the film a year later. Kenneth Branagh played Reinhard Heydrich in the 2001 cable movie Conspiracy, about the Nazis&#146; Wannsee Conference at which the Holocaust was planned, and he does an excellent job narrating The Goebbels Experiment. He adopts a very slight German accent, but never lapses into cartoon villainy. Instead, he allows the pure venom and evil of Goebbels&#146; own words to come through unadorned, exposed to the world. The power of the film is that even with all we know about the Nazis, we persist in believing that they were on some level understandable. The Goebbels Experiment reveals its subject as a psychopath, so totally remote from his fellow men and so purely a self-interested predator that it&#146;s like reading the diary of the creature from Alien.